With all the great tactical flashlights out on the market right now, it is hard to just find a cheap tactical flashlight. We look at 3 of the best flashlight options that fit this criteria. 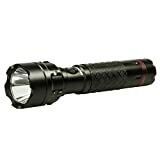 Whether you just love the look and feel of the tactical flashlights, or you are in the military or police department, a cheap tactical flashlight is always a great choice as a backup or to lend to a friend. Yes there are several cheap tactical flashlights models on the market and they do not compare to the high-end tactical flashlights, I wanted to cover a few that you might not have thought about in the past. The Nebo Redline series by Nebo is probably one of the finer cheap tactical flashlights that I have found. Even though it is under $40 it gives the end user every thing that they need when looking for a cheap tactical flashlight. The flashlight is made out of anodized aircraft grade aluminum that is water-resistant and has a compact body design. 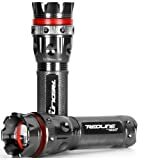 The Redline series is the brightest flashlight of Nebo at 220 lumens, plenty of light to blind the intruder at your house. One of the surprising things that this flashlight can boast about is the runtime on high mode. At 4 hours of continuous illumination, this beat many of the high-end tactical flashlights out there. The #5557 Nebo Redline has 5 modes which includes; 200 lumens / 110 lumens / 22 lumens / S.O.S / Defensive Strobe. Another great note about this cheap tactical flashlight is the battery type it uses; only 3 AAA batteries and they come with the flashlight to help you get started. Now the #5557 Nebo Redline does have an adjustable light beam from flood to solid, so that does give some users additional benefits in certain circumstances, i.e. finding your campsite in the woods. The Life Gear brand flashlights are starting to make a headline appearance in many sporting good stores like Academy Sports, Walmart, Dicks Sporting Goods and more. The company has done a great job at marketing their products to the masses and I think they have some good points to talk to you about. I would say that the brand as a whole is geared toward the weekend warrior/family campers, but the Life+Gear’s Highland Series 150 lumens tactical flashlight deserves a spot on the cheap tactical flashlight list. It is made of a high quality aircraft-grade aluminum and had the tailcap push button, which is one of the most important features of a tactical flashlight to begin with. However, what really intrigues me is the Red Emergency Flasher. The Red Emergency Flasher is unique in the sense that it uses a built in red flashing light for situations that you need to call for help while hiking, working, or camping. You can simply turn it on and run for hours and hours without draining the battery with an S.O.S flashing. This cheap tactical flashlight also comes in an 80 lumen version / 200 lumen version / 400 lumen version / 700 lumen / 1000 lumen version. The Life+Gear Highland Series flashlights are not going to withstand huge amounts of abuse like a high-end Tac torch will, but this torch can give you just what you need for the majority of activities you will need it for. 1,502B portable flashlight .Flashlight power by: 1 x 18650 Battery. (Battery not includes). 2,5 Modes: High, Medium, Low, Strobe, SOS (The modes has no memory function). 3,High lumen flashlight: High-Efficiency and Great Output XP-G3 LED bulb,Super Bright Tactical Light 1000 Lumen max.Intense Spotlight for long range observation can up to 200 meters max. 4,Waterproof flashlight: IPX-6 waterproof designed make it water resistant in heavy rain.Durable Military Grade 6061T aluminum alloy body and shock-resistance design make it tough and reliable. 5,Widely used:searching,hunting,outdoor,camping,hiking,trekking and other activities. You may not consider the Ultrafire brand a true tactical flashlight but take a second look. The Ultrafire t6 XML has some pretty decide things going for it. The manufacturer claims it can hit 1000 lumens on high mode and gives off a bright white adjustable beam. It has 3 modes and each mode is adjustable from flood to solid beam. The typical tailcap switch, made from Type III hard-anodized aluminum. The neat thing about this cheap tactical flashlight is that Ultrafire gives you 2 different reflectors, a smooth one and an orange peel reflector like Fenix has on their tactical flashlights. It does have coated glass lens for durability and scratch resistance too, which a nice touch. The Ultrafire T6 XML does use a 18650 rechargeable battery so that can save you on the cost of batteries over time. I really like this flashlight and I do consider it to be classified as a tactical flashlight but would not really on this light for life threatening situations or my main flashlight. This cheap tactical flashlight is perfect for backups, household use, keep in the car, etc. It can mount to rifles and handguns as well. Although these are considered the best flashlights for a cheap price, you might have your own cheap flashlight that you would like to share with us. Feel free to submit your flashlight review or leave a comment.